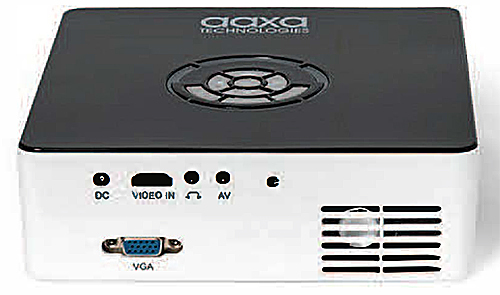 The NEW AAXA M6 breaks new ground for a 1080p projector. Fully portable, with both a power block and battery included, it's rated at 1200 "LED" lumens of brightness in a 2.5-pound package--or 500 lumens with battery power. 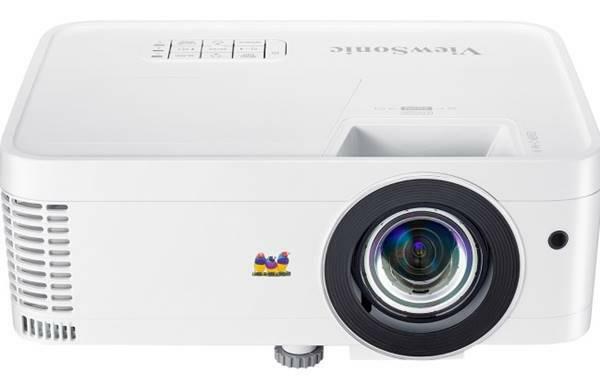 One of only two Full HD projectors under 3 lbs at this writing, it boasts the higher brightness rating of the two--by 200 lumens--as well as the lower price, at $599. Available for pre-order now, it's expected to start shipping in another week or two. AAXA refers to the M6 at various places on its website as a Pico Projector, an LED Micro Projector, and an HD LED Projector. Taken together, the three descriptions cover some of the M6's most important features: it's highly portable at 2.5 pounds and 2.1" x 7" x 7" (HWD), it delivers a native 1920x1080 resolution, and it uses RGB LEDs as a light source--which have the environmental advantages of low energy use and being mercury-free. They're also rated at 30,000 hours. The included Li-Ion rechargeable battery offers a 90-minute life in the projector's Eco mode. There's also an audio out mini-jack for a headset or external audio system. Setup is typical for the breed. The thumbwheel focus control is on the right-side along with the power switch, as viewed from behind. There's no zoom, so the only way to adjust image size is to move the projector. AAXA says the 16:9 diagonal image size can range from 12" to 200". With the 1.1 throw ratio, the distance from the screen for that range would be about 11" to 16 feet. Though it will go to 200" diagonal, at 1200 lumens the image will be dim at that size. The largest practical image size with moderate ambient light is likely to be about 90", with the M6 about 7 feet from the screen. You can use the AAXA M6 Projection Calculator to find the throw distance for the image size you want. One unusual touch is that the M6 supports only a 16:9 aspect ratio. That's obviously most appropriate for HD video input. It can work for presentations as well, as long as the source can generate 16:9 images, or you don't mind a slight elongation or squashing of the image. 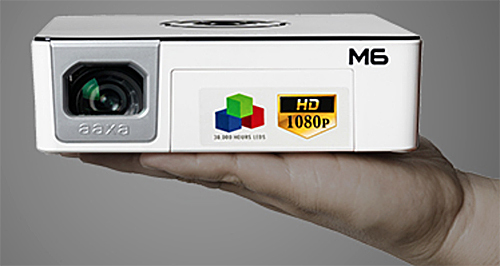 Like many smaller projectors, the M6 includes an onboard media player that can read photo, music, text, and video files in a variety of formats. There's no onboard memory, but there's both a USB Type A port and microSD card slot on the right side as viewed from behind. The back panel offers ports for power, HDMI, VGA, audio out, and an A/V input for a supplied cable with connectors for composite video and stereo audio. Also included with the M6 is a remote, power adapter, and carrying case. AAXA has a long history of building capable pocket- and palmtop-size LED-based projectors, so it isn't surprising that AAXA is one of the first to market with a Full HD model. It's also not surprising that the AAXA M6 offers a lot for the price. It's packed with features that make it a strong choice as a fully portable projector, but capable enough--particularly with the audio upgrade option--for fixed installation home theater on a budget. At 1200 lumens, 1920x1080 native resolution, and just $599 it promises to be a compelling choice if you need Full HD resolution in a portable package, or an inexpensive replacement for a large screen HDTV in a family room. Hard to believe that the fact that there is NO KEYSTONING available with this projector was not mentioned here. It's a important detail. Paul, this is a New Projector Announcement, not a Review. New Projector Announcements are intended to spotlight noteworthy new models coming onto the market that we have not had a chance to test or evaluate. A separate Review of the M6 is scheduled, and if there is no keystone adjustment on it the reviewer will note that in the Limitations section. I bought one of these for business use. It hooks up to my MacBook Pro via the HDMI connection. I use wide screen on PowerPoint so the fact it is 16:9 poses no issues to me. It is brighter than I expected but the fleshtones and reds are way off even after correction. Good for presentations not movies. If they fix colors in a firmware update it would be perfect.